Over the years, I have talked to scores of people who enthusiastically share what God has called them to or told them to accomplish. Sadly, when I run into them later, I learn that they haven’t followed through. I find that something distracted them, that they decided their own ideas superseded God’s, or some such other excuse. 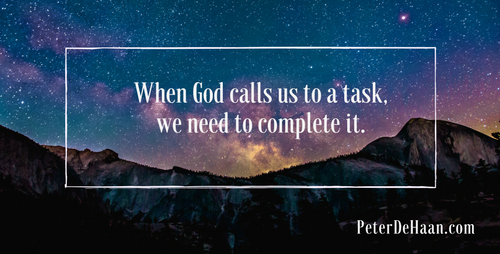 When God calls us to a task, we need to complete it.